I sought more information about the bombing and events of the time. One line of enquiry was to publish a request for information in the London Police Pensioners magazine. 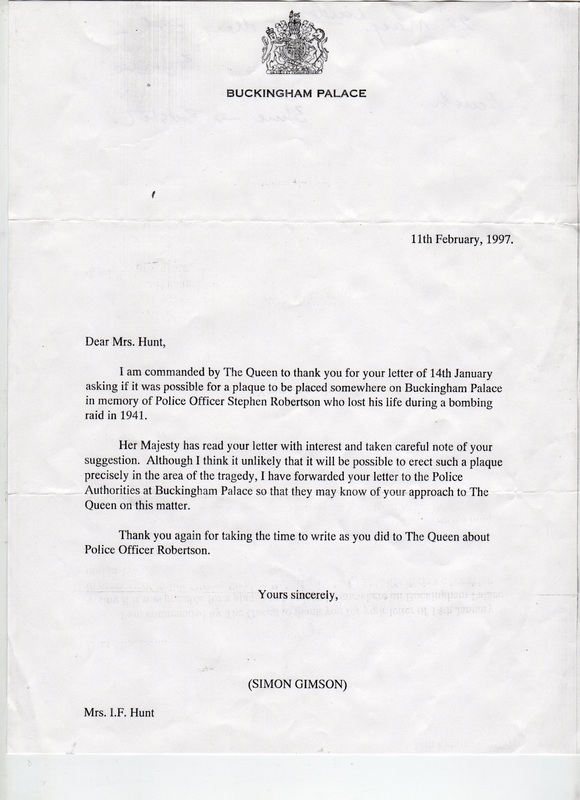 This proved very fruitful as I soon recieved a letter from ex PC 496'A' Ron Pope who had served at the Palace during the war and had been friends with 'Steve' Robertson. He informed me why Steve was where he was at the time of the bombing and his own invovlement afterwards. Shortly afterwards Phil 'Ginger' Eagles (ex PC 216'A') arrived at the Palace gates, luckly whilst I was on duty, with many a tale. He had taught Steve 'beats' at Cannon Row (AD) and had been on duty and directly involved in trying to save him that fateful night. I was beginning to form a detailed story to the events surrrounding the bombing and its aftermath. It was at this time I felt it fitting to have a memorial plaque errected either at the new Police Lodge in the grounds of the Palace or at the scene of the bombing. 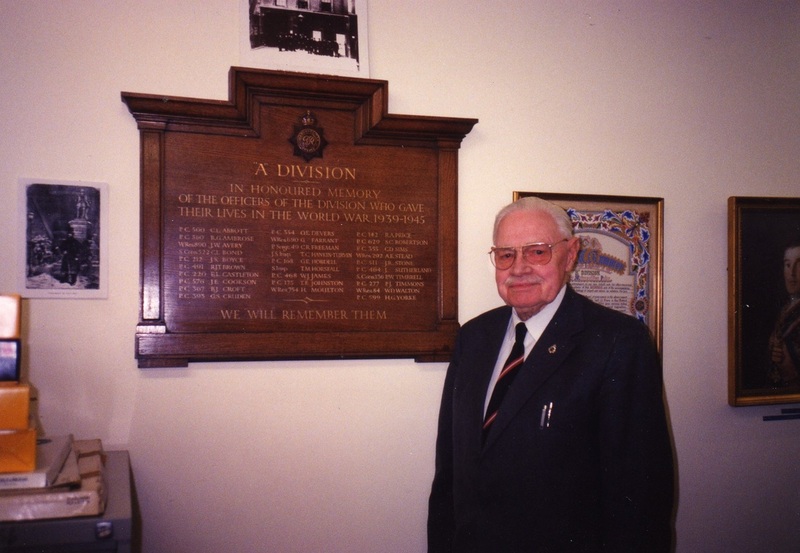 As I started to compile the final draft to request a plaque Doug Lightwood (ex PC 546'A') contacted me with further background information. It is to these gentlemen that I give my thanks for helping me confirm the details of the events at the Garden Gate on the evening of 8th March 1941. Once my report had been submitted I continued contact with Steve's ex collegues but there appeared a reluctance to approch the Household to gain permission to errect a plaque for one reason or another. 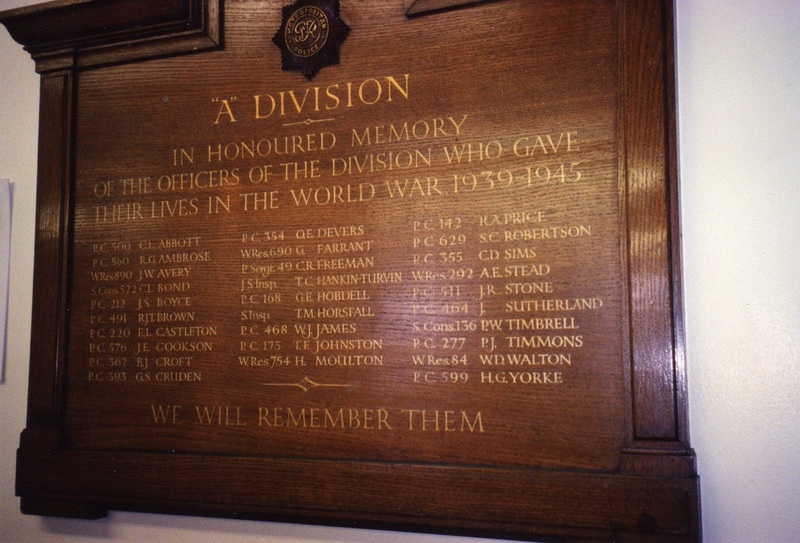 Steve was already listed on a plaque dedicated to the fallen from 'A' Division but this had been removed to the archives when Cannon Row went through operational changes. As a serving officer I was limited as to what I could do but Doug Lightwood made Steve's name public when in May 1995 the Daily Mirror requested details behind the bombing after HRH Princess Margaret mentioned it in an interview. Then in October 1996 he informed me that a book about the Palace was being researched by Baroness Healey and that she had taken an interest in the story. He was then contacted by a Mrs Irene Hunt who lived in Canada. She had known Steve for a number of years. She had also contacted the Palace asking why nothing had ever been mentioned about the death or why a plaque had not been errected. Shortly after this letter was sent I was summoned by my superiors to brief them on the story and was asked to produce an edited version of the booklet I had produced for the Department.